Last week, I highlighted one of the surfactants in conditioner which prompted a question....given SLS is a surfactant, are surfactants really good? The best analogy I can give is the apples and oranges story. Both are a type of fruit but each is different and useful for its own reason. So how can the same surfactant behave differently? 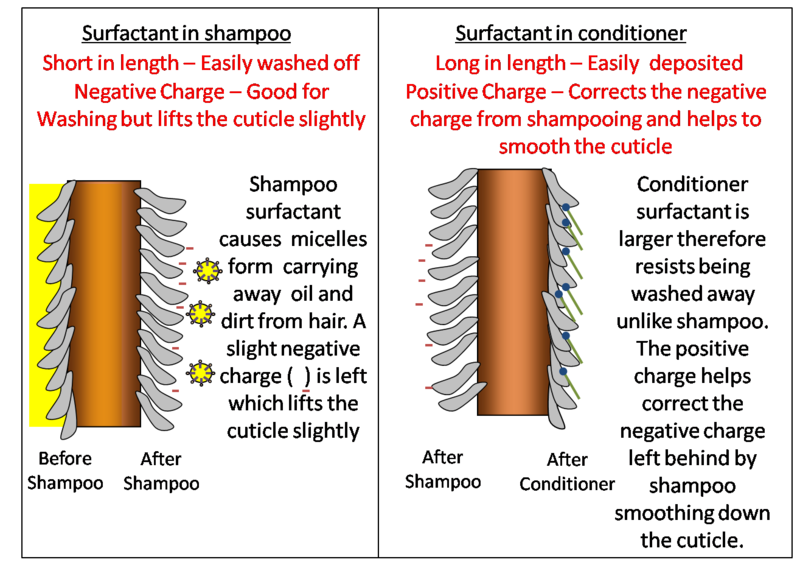 Do note that while conditioner pretty much always has large positively charged surfactants, shampoo does not always have a negative small surfactant. 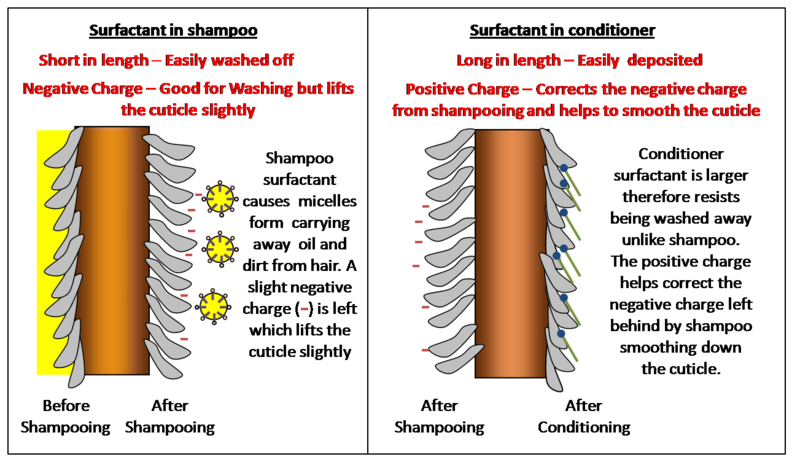 Some sulfate free shampoos utilise surfactants that are larger and have no charge or have a variable charge depending on pH - however that is a story for another day. So are surfactants bad? 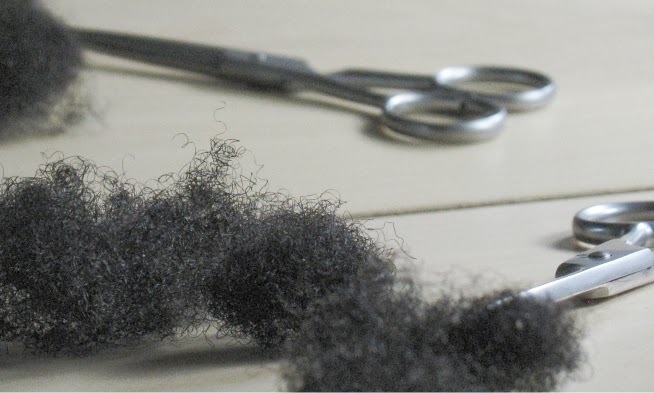 In my opinion, no, they are vital to cleaning and maintaining hair! 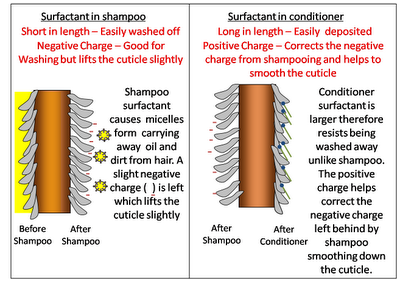 How do surfactants work in a 2-in-1 shampoo plus conditioner? Salamanda - Not very well is the direct answer from my experience lol. The thing with 2 in 1s is that they seem to work well for people who have straight hair which has a tendency to get oily. This is because they are much more similar to a conditioning shampoo rather than a conditioner. They tend to contain negatively charged surfactants for cleansing and some neutral silicones for conditioning. I have yet to find a 2 in 1 shampoo that actually provided sufficient conditioning. They do make for a gentler shampoo but the conditioning part in my opinion is pretty rubbish. I'm wondering how the shampoo causes a lifting of the cuticle.From your post on pH I recall that the cuticle does not really change much between pH 4-9 which is where most shampoos would fall. So, is the "lifting" a result of the charge balance on the hair being disturbed by washing, resulting in the need to correct it by applying conditioner? I have also used 2-in-1 shampoo+conditioner products. Just wondering if they generally work the same way by simply having a combination of the negative surfactant for shampooing and the positive surfactant for conditioning. Finally, great post as always. I like your blog because I always learn something. Have a lovely day! 2 in 1 shampoos do not tend to have a mix of negative and positive surfactants because if you put both of these into one product they have a tendency to attract each other and form what we call a complex. The complex tends to do pretty much nothing at all because the active parts of the surfactant which should bind to the surface are not used. In fact one paper that I read showed that build up can occur because of these complexes. 2 in 1s therefore employ neutral or what are known as zwitterions (i.e they have both a positive and negative charge which are separated). Other conditioning agents such as oils, proteins etc may also be included. yayy!!! i really have nothing useful to add, just writing to say I hope you will be publishing more often, since you are all I have until April ends, lol. lol Lady Jaye, I did actually say there was a treat in store for those who read the link lol. I'll pass the compliment to my mama !! Hello Jc. Again, great post! I hope you have time to answer this follow up question. Could this be an argument for using products from the same family line (not so much the company parent (e.g. Unilever), but the individual product lines (e.g. Dove, Suave)) since they can ensure the right balance between surfactants in shampoo and conditioner to equal this smoothing effect? Nice question Rachael! I would say no. A company may make a fantastic shampoo but the conditioner may not have the surfactants that your particular hair likes (or vice versa). I think any conditioner which has a cationic surfactant will smooth down the cuticle. However the main reason why some people prefer one conditioner over the other usually relates to the 'feel' of the hair after conditioning. Each brand has a certain combination and amount of surfactants that it uses in conditoner. Therefore switching to different conditioners within the brand and switching to different brands will give you wider testing over a range of conditioners and help you find the ideal amount and type of surfactant for you. How do moisturizing shampoos work? I know there are some which have gentler alternatives for SLS but what about shampoos that have SLS but then also have things like shea butter or coconut oil? Do the oils/butter mitigate the effect of the surfactant? Isn't this counterproductive and wouldn't it then be better to just use a heavier leave-in after using a "regular" shampoo?